Summer is the time many people head to the beach to enjoy a refreshing dip in the sea to wash away the years’ hard work. Being bitten by a shark remains a concern for many beachgoers even though statistically, the chances are extremely low. Last year, worldwide 72 people were bitten in unprovoked incidents with three deaths. In South Africa this year, five people have been bitten by a shark with no fatalities. Of the more than 500 species of shark, only the great white, bull(Zambezi) and tiger shark, pose a significant threat to humans. All three of these species occur in waters off Africa. So, here are four shark safety tips you can use to avoid being bitten by one of them. Ocean surveillance is one of the best ways to make sure the paths of people and sharks do not overlap. While using the ocean is always at your own risk, life guards or organisations like Shark Spotters provide extra security by giving relevant warnings and assisting in the event of an emergency. Always obey beach officials, lifeguards and shark spotters if told to leave the water. And first-time visitors should ask them about the area before heading in. Always pay attention to shark signage on beaches. Do not swim, surf or surf-ski when lots of birds, dolphins or seals are feeding nearby. This activity suggests there are schools of baitfish and other predators, like sharks, in the area. Along the same lines, avoid areas where trek-netting, fishing or spear fishing is taking place because sharks, just like the fishermen, are attracted to the fish. Dead whales are like a giant magnet for sharks, so do not swim, surf or surf-ski if there’s a whale stranding nearby. 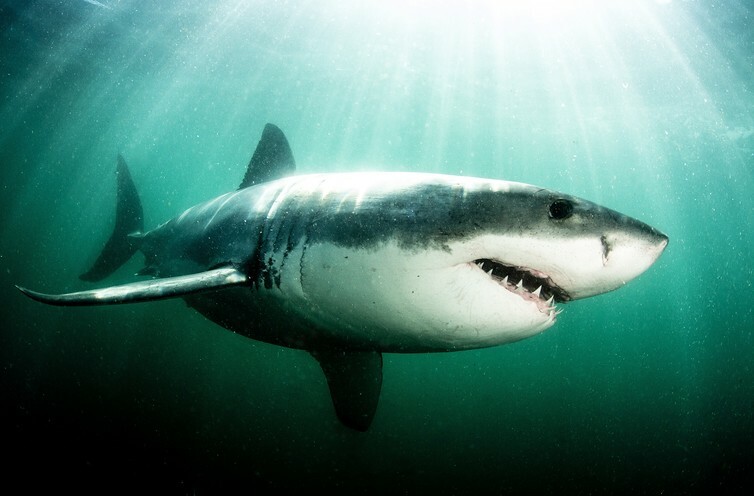 Sharks, like lions, are ambush predators and use their habitat to their advantage. They like to hunt near deep water channels next to drop-offs and kelp forests. They also use low light like dawn and dusk and murky water to hide in, and sneak up on their prey. River mouths are another place sharks like to feed near because they are so attractive to fish and often water visibility is very poor which is to the sharks’ advantage. You are vulnerable on your own and there is safety in numbers. The more people in the water with you, the more chance of spotting sharks and having someone close by to lend a hand in case of an emergency. If you are kayaking or surf-skiing far out to the sea, consider paddling in groups and staying close together. If you really must be on your own, think about using an electronic shark repellent. Although there is no shark deterrent on the market that guarantees your safety 100%, the Shark Shield, has proved effective in some scenarios. If you are surfing, kayaking, diving or spearfishing in areas where encountering a shark is likely, then this is a good option to consider. Sharks have acute senses, especially smell. So if you are diving for crayfish do not use a bait bag and similarly, if you spearfish, do not carry your fish with you as this will attract the attention of sharks close by and you may find yourself in competition with a large shark. Always remember that the ocean is a wild space with wild creatures, which means there are no 100% guarantees. But the risk of being bitten by a shark can be lowered if people exercise caution and are aware of their environment.